Here is a prayer that those leading worship on Sunday may want to use. The anniversary will be a yearlong celebration with events taking place around the connexion so please do let your networks know. We would love to hear how our brothers and sisters are celebrating Susanna so if you are made aware of any Susanna Wesley inspired events taking place please let us know so that we can add them to the Susanna350 online calendar. We would like to encourage the Methodist family to share their stories. Please do send these to me with images (permissions agreed) if at all possible. By learning something of Susanna Wesley, what has it meant to you in your faith, life and discipleship? Have you been inspired by Susanna Wesley recently? Having learnt something of Susanna, what is God calling you to do? 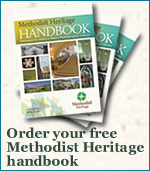 “…heritage in the Methodist Church is about - contemporary mission. Not dwelling in the past, but using our history to signpost a way to transform the future through the love of Christ…” – Joanne Hibbard, Director of Engagement in the Connexional Team.